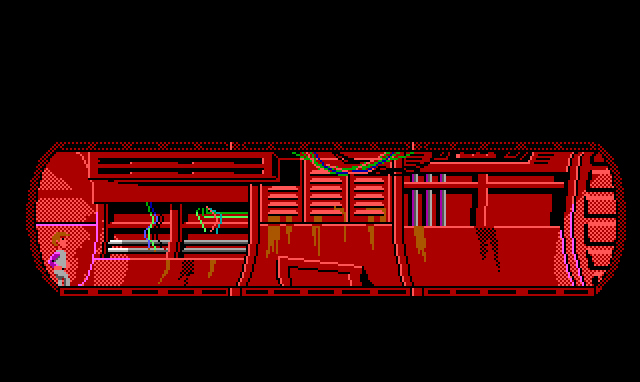 One of my favorite rooms in adventure games is the metal tunnel from the garbage ship in Space Quest 3. Being claustrophobic, I had to overcome my fear and stay as much as possible inside the tunnel to admire the simplicity of this beautiful background. Blacking out the outside surroundings of the tunnel is a usual technique used in art generally as seen in some other games or even comic books. But in this case it adds more mystery specially that the palette changes drastically from the previous rooms in the game. All the previous rooms had blue backgrounds with little red components. 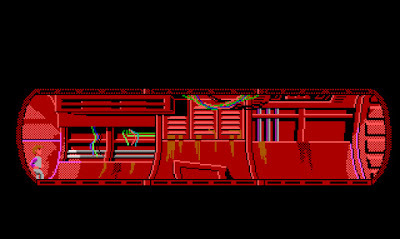 The percentage of blue pixels drawn in the tunnel is much less than the red pixels used in the blue backgrounds throughout the game. On first entry, the player is forced to think quickly since Roger is already walking towards the darker center then the other side of the tunnel. Note that the player's mind is already setup from the background music and perhaps have seen the giant rats too. So one would definitely smash the space-bar on the keyboard to activate the text input box and pause the game. An interesting part is Roger's shadow near the exits. The 1 pixel high walk-able area limits the walking animations used to sideways only. Perhaps this is used to minimize the number of sprites needed for the shadow animation. Another important aspect of the room is the use of roundness. Roger seems a little sinking in the tunnel which in my opinion is a brilliant simple use of foreground. After walking for a little more and the shadow disappears due to darkness, the action begins. You can interact with the dangling wires, walk more and get one of the biggest shocking surprising moments I ever felt in an adventure game as a child. Boom! A giant rat falls from above and fights Roger. Should I type something? Should I move? What do I do? The fight doesn't last for long. You don't die but you lose a couple of inventory items as if the whole fight intends to give you an idea of what kind of smart game you are dealing with. Interesting read :) The use of the shadow is really nice.